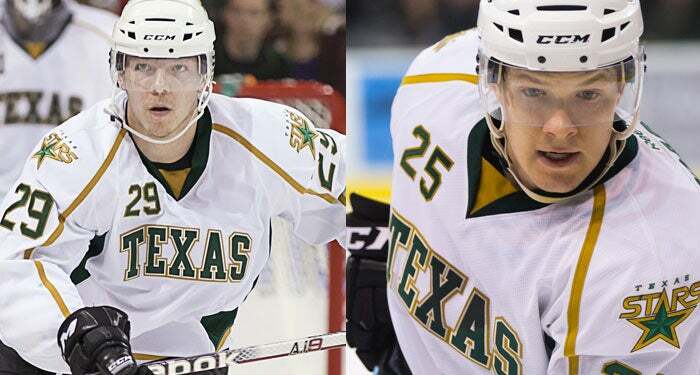 CEDAR PARK, TX – The Texas Stars, proud American Hockey League affiliate of the Dallas Stars, announced today that Dallas has recalled left wing Matt Fraser and right wing Alex Chiasson from Texas. Both Chiasson and Fraser were part of the four-player move Dallas made prior to today’s NHL trade deadline which sent those two forwards to Texas, along with right wing Colton Sceivour and defenseman Jordie Benn. Today’s transactions made all four players eligible to be returned to the AHL Stars for the 2013 Calder Cup Playoffs. As per NHL rules, teams are allowed four non-emergency recalls after the trade deadline passes, thus Dallas uses two of those four by recalling Chiasson and Fraser. Both players can be returned to Texas to play for the AHL Stars at any time during the remainder of the 2012-3 regular season or the 2013 Calder Cup Playoffs. Fraser, 22, leads Texas with 46 points (33 goals, 13 assists), while posting 26 penalty minutes and a plus-13 rating in 62 AHL games this season. The Red Deer, Alberta native currently leads the AHL in goals and power play goals (17). Earlier this season, Fraser was selected to represent the Western Conference at the 2013 AHL All-Star Game. Fraser has skated in three games this season with Dallas, and recorded one point with a plus-2 rating. He earned his first career NHL goal against the Nashville Predators on Feb. 25 and has skated in four career NHL contests. Fraser went undrafted and was signed as a free agent on Nov. 17, 2010. Chiasson, 22, earned his first NHL call-up on March 21st and was a healthy scratch for Dallas that night at the Los Angeles Kings. The St. Augustin, Quebec native currently ranks third on Texas with 35 points (13 goals, 22 assists), along with 43 penalty minutes and a plus-three rating in 57 AHL games this season. Chiasson began his professional career last season with Texas after spending three seasons at Boston University. He led BU with 46 points (15G-31A) last year in his junior season and was named a 2012 Hockey East Honorable Mention All-Star. The 6-foot-3, 206-pound forward was Dallas' second-round selection (38th overall) in the 2009 NHL Entry Draft. The Dallas Stars faceoff against the Anaheim Ducks tonight at 9:00 p.m. at Honda Center (TV: FOX Sports Southwest; Radio: 1310 The Ticket). The Texas Stars continue their three-game home stand on Friday April 5th against the Oklahoma City Barons for a 7:30 p.m. faceoff at Cedar Park Center. Friday’s game against the Barons is another Texas Lottery Lucky Section Night, a $3 Beer Night and the fifth Texas Stars Player Magnet Giveaway. 2013-14 Season Tickets are now on sale. Put your deposit for 2013-14 season tickets and receive priority for both Texas Stars 2013 Calder Cup playoff tickets and 2013-14 season seat selection. For more information on Texas Stars season tickets call (512) GO-STARS (467-8277) or visit www.TexasStarsHockey.com.